Need boat lettering? 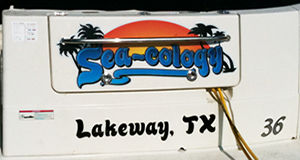 Signquick specializes in custom boat graphics and boat names. We also design, manufacture and install everything including registration numbers, names, logos and full wraps. Take a look at our gallery or use our online design tool to design your custom name. Need help with custom boat lettering? 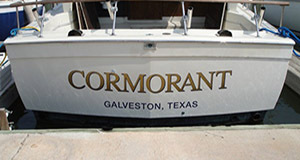 Signquick specializes in creating custom boat names. We can schedule a site visit to measure your boat and take photos. After photos are taken we will design your boat graphic to your specifications then manufacture it and install it. We are truly a one stop shop for boat lettering and graphics. 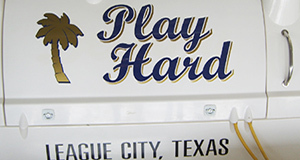 We service many cities around Houston including Seabrook, Kemah, League City, Webster and Galveston. If you want to save some money and design your own boat name, use our easy to use online boat lettering design tool which lets you to create your own customized boat lettering or graphics in minutes. Just enter your text, choose your font, colors, and effects and you are ready to go. We only use high quality marine grade vinyl. Choose from hundreds of fonts, colors and graphics. All of our boat lettering comes pre-spaced on a sheet for easy installation. Save some money and install boat graphics yourself. You can read instructions here. If you ever have any questions, please give us a call or stop by one of our locations. Signquick can handle all of your custom boat graphics needs. From boat names and registration numbers, all the way through to detailed boat graphics. Signquick has been in business since 1999 and has two locations which are in Seabrook Texas and Webster Texas. If you are looking for special colors or a unique design, please stop by our Seabrook location to look at our diverse inventory of materials. Looking for the ultimate in boat graphics? Ask about our 22 karat Signgold material. We usually outline the Signgold with a black stroke for readability. 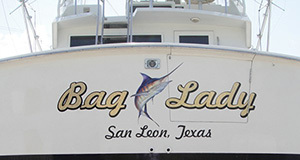 Take a look at the Bag Lady boat.